BBQs are a favorite around here from spring through fall [and often even in the midst of winter]. In fact, we have already done a barbecue a handful of times in the mere few weeks the weather has been nice. Not to mention I love how healthy it is the way I make mine. Typically I take scored chicken [leg and thigh pieces] and marinate it with black pepper, garlic powder, cayenne pepper, paprika, lemon juice, yogurt, raw papaya, some tandoori masala and some tikka masala. Working with scored chicken does wonders for the marinade to seep inside. Some days, I use my homemade tandoori masala mix instead, which you can find by clicking here. Let the chicken marinate before cooking it over the charcoal on the barbecue grill outside. This recipe is so versatile and I have used this recipe in many ways: cooked slowly over low heat on the stove, in my George Foreman grill, in the oven, with boned-in meat and boneless: it’s a fail proof go-to recipe. Not to mention I have used the chicken in many things: on top of pizza, in wraps, burgers, and pita pockets to name just a few from the top of my head. The possibilities are endless. 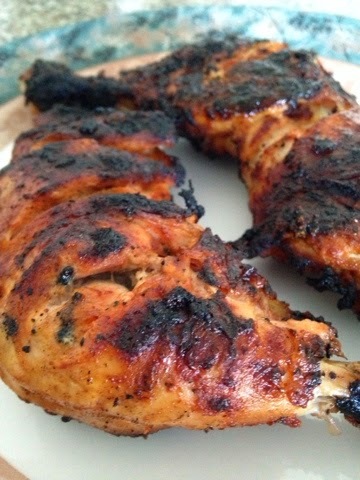 Serving this chicken barbecued alongside the raita I mentioned on this post is absolutely delicious and a perfect pair.